I’m lucky to have found an excellent summer job, one that will take me back out of the country for about 5 weeks this summer. I’m heading to Guadeloupe, a French island in the Caribbean, as a trip leader with a program called VISIONS Service Adventures. VISIONS runs community service programs for teens that blend volunteer work, cultural immersion and adventure. 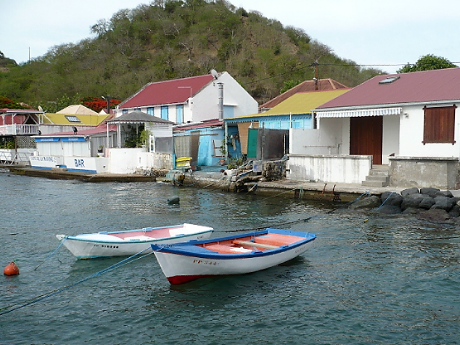 In Guadeloupe, we’ll be living in a fishing village on the small island of Terre-de-Bas. Our service projects may include renovating public buildings, paving walkway, landscaping, and trail maintenance. Participants will work with young children at the local library and apprentice with fishermen, sorbet vendors, and local craftsmen. Hiking is our frequent past-time, usually ending at a beach. The trails lacing Terre de Bas lead to gorgeous vistas overlooking the sea and unspoiled coves. We ferry to Terre-de-Haut to tour the shops and to the mainland where we tour marketplaces alive with madras plaids and hike to La Soufriere volcano, natural parks and nature preserves through rainforests and to mountain waterfalls. We snorkel, kayak and scuba dive. We learn Zouk and Gwoka (Creole for “big drum”), the dancing and persistent drumming that “underpins the island’s musical tradition, like the solid wood of a table beneath a fancy dinner service. I’ll be somewhat out of touch until I return to the US at the beginning of August, but you can reach me by email until then. J’ai de la chance d’avoir trouvé un super job d’été en Guadeloupe, et donc je repars à l’étranger pour cinq semaines de plus. Si tu ne connais pas bien les DOM-TOM, la Guadeloupe est un archipel français situé dans la mer des Caraïbes. Je vais être un des responsables d’un groupe de lycéens américains qui partent pour faire du bénévolat, découvrir la culture, et vivre une grande aventure avec VISIONS Service Adventures, une association américaine.